The 20 minute show is broadcast each weekday at 5:25 pm on CBeebies. The series producer is Daniel Bays and the series director is Adam Shaw. 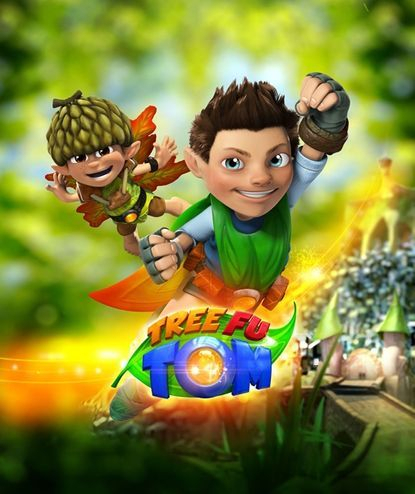 In the UK episodes are also available on BBC iPlayer, there is a link Tree Fu Tom officail website. It's the Biggest Chuckleberry In Treetopolis contest and Ariela and the Mushas are both determined to win the trophy. With the competition reaching fever pitch and giant chuckleberries poised to cause havoc across Treetopolis, Tom needs all of his action-hero skills and Big World Magic help from the audience to ensure the rightful winner receives the trophy. Tom must bravely lead his friends in search of their squizzle, lost in the garden of Rickety McGlum, a spider believed to be mean. As the hunt through the garden infested with slime-spitting weeds turns into a rescue mission. After one of Zigzoo's magical inventions spectacularly fails, he decides to quit inventing forever. Trying to encourage him to invent again by making up silly problems for him to solve, Twigs inadvertently causes a disaster that threatens all of Treetopolis and only Zigzoo can fix it. Tom and his friends have to convince Zigzoo to return to inventing before disaster strikes. Tom and Twigs are in for a frenzied, rollercoaster day when they swap Spell School for running Ariela's ranch. Tom needs his friends and Big World Magic help from the audience to calm the bedlam that's in store, and maybe they'll all discover that the grass isn't always greener. A game of hide and seek goes awry when Squirmtum's fear of the dark causes a disaster. It's only with Big World magic help from the audience, and by helping Squirmtum to overcome his fear, that Tom stands a chance of saving his friends and Treetopolis from a cavernous calamity. Twigs causes no end of trouble when he uses a magic pebble to grant his every wish. Worse still, a magic pebble in the hands of the Mushas could spell catastrophe for Treetopolis. Battling against a bizarre barrage - from a giant rolling cupcake to an epic slick of stinky slime flooding the castle streets - Tom has to step up to save the day. When Zigzoo hastily builds a robot to help him with his jobs, it quickly causes more problems than it solves. Tom needs Big World Magic help from the audience to fix the mishaps and mayhem that spring up all over Treetopolis. As the frenzy unfolds, perhaps Zigzoo will see that it's better to do a few things well than to take on too much and do nothing properly. When Squirmtum falls out with Tom and the other Treelings, the Mushas trick him into helping them with their audacious plans for mischief to get hold of magic spell books. Tom must unravel the mystery of what the Mushas are plotting in order to win back his friend and save the day. When a colony of hungry bees moves into the ranch, Ariela's unwillingness to share her nectar spells disaster for everyone. The situation escalates and lands her friends, her critters, the bees and her whole ranch in danger. As ever, only Tom can avert a sticky end and save the day. Tom and his friends decide to help Squirmtum the woodlouse realise his dream of flying, but Squirmtum's over excitement leads to catastrophe. An action-packed aerial rescue becomes an epic underground rolling race against time. When Tom and Twigs break Treetog's casting crystal due to their conflicting approaches, it's a race against time to find a replacement before all magic runs out of Treetopolis! As their differences lead to squabbles, the rescue and their friendship is threatened. The Mushas, Puffy and Stink, trick Tom and Twigs into carrying out their mischievous plans to mess up Treetop Castle. If Treetopolis and his friends are to be saved from a mucky muddle, Tom must summon the courage to question things that he knows in his heart are not to be trusted. It's the day of Ariela's Rip-Roaring Rodeo Show and, despite having far too much to do, she won't let anyone help her. As Tom, Twigs and Squirmtum struggle to master their performance pieces and the mushas get to work messing things up, Ariela's ranch and her rodeo are thrown in to disarray. Ariela needs to learn that accepting help from friends is far stronger than struggling on alone. Tom leads his under-performing squizzle team on a quest to find the enchanted squizzle to help them play perfectly. They follow clues and overcome epic challenges on their journey to win help from the mysterious Squizzle Master. Tom and his friends must learn valuable lessons about teamwork to win through. Tom and his friends' greed for the tasty treefle treats growing all over Treetopolis for just one day leads to trouble. What starts as sharing descends to frenzied competition - can Tom overcome his own greed and get his competing friends to cooperate before disaster strikes? Tom and Twigs get a crash course in being ranchers as they have to lead an epic baby beetle drive on their own. With only their wits and a whistle to help them, Tom and Twigs must guide the unruly young beetles through the myriad challenges of the open branch road to reach the high pasture and the beetles parents. Ariela's impatience causes trouble for Tom and Treetopolis! When Zigzoo creates an invention to help Ariela grow her crops super fast, everyone gets more than they bargained for. Tom must battle against all manner of giant planty problems to help his friends. Tom's attempts to attain perfection cause problems for rare Treetopolis visitors: the humblebugs. Trying to impress Treetog spells disaster for Tom and his perfect plan becomes a race against time to literally pick up the pieces. Treelings and Mushas are thrown together to compete in Treetopolis' annual treasure hunt, with disastrous results. For Tom, tracking down and solving magical clues in a race around Treetopolis is the least of his worries as he is paired with Stink who still seems set on causing mischief! It's the Annual Tidy Up in Treetopolis and Tom's careless cleaning efforts lead to disaster. With grey, polluted sap seeping everywhere - turning everyone it touches in to statues - and magic working backwards, Tom has to act quickly to save his friends and undo the damage he has unknowingly caused. Preparations for Sap Day in Treetopolis are thrown into turmoil as the Mushas decide to change the celebration to Stink Day, with stinky fungi that send the smeller to sleep. As his friends fall asleep one by one, it's up to Tom to solve the mystery of the magical sleep, put a stop to the Mushas' mischief and save Sap Day! Tom and Twigs' friendship isn't the only thing threatened when Twigs gets a new pet called Grubbles. Impatient to play, Twigs casts a Hungry Tum spell on Grubbles to speed up feeding time and the problems for Tom begin to grow, literally! When the impulsive behaviour of Tom and friends gets them into trouble it's up to Rickety, with his more thoughtful approach, to leap to the rescue! Rushing into a search for a lake of especially powerful sap, Tom needs Big World Magic help from the audience and a lesson or two from Rickety to save himself and his friends. Zigzoo invents a weather machine to create perfect conditions for each of his friends, but disaster strikes when he tries to keep everybody happy. Tom tackle titanic troubles in Treetopolis, as he is accidentally shrunk to the size of Twigs’ toes! Tom faces the biggest challenge of his time in Treetopolis, trying to find a way to get back to his normal size in the midst of Musha mischief. A calm, quiet pond creature becomes a titanic cause of trouble for Tom and friends when it accidentally absorbs Tom's sapstone. How will Tom cope without his magic powers? This was the final episode of series one.